00:33:00 Makes 4 servings, 1 burger (258 g) each. 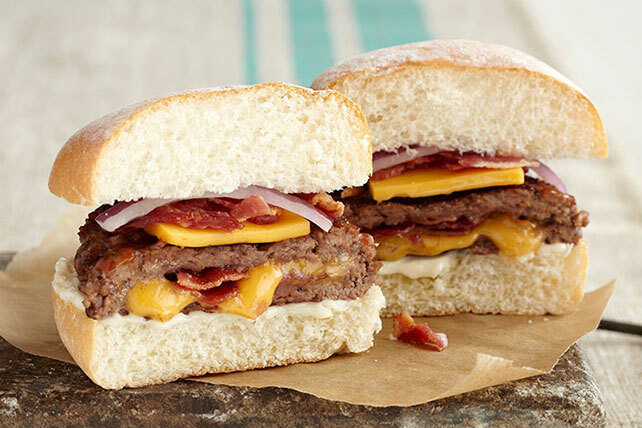 These Cheesy Bacon-Stuffed Burgers get a double dose of cheese and bacon! Cheddar cheese is mixed with bacon and stuffed inside these homemade beef patties, and then layered on top with more bacon and red onions. Now that's a burger! Spread bottom halves of buns with Miracle Whip. Fill buns with burgers, Singles, remaining bacon and onions. Serving Size Makes 4 servings, 1 burger (258 g) each.